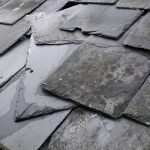 Leeds roofers DPR were called north of the city last month to deal with a domestic roofing and gutter problem in Wetherby. An inspection at the property on Linton Road identified that the roof had clearly suffered significant damage to several sections due to general wear and tear, water pooling, and vegetation growth. To rectify the problem, DPR’s experienced roofers stripped off the exiting rear elevation flat roof to the utility area and disposed of that accordingly. The team then fitted new boarding and upstands along with a new high-quality fibreglass roof system that is guaranteed for 20 years. Once the roof was installed the roofers fitted new guttering and fallpipes made from high-quality material which was directed to a central pathway section via an underground drain to an existing gulley. To install the underground drain the team had to remove a small part of the pathway but this was fully restored upon completion of the works. For all domestic roofing workings in and around Leeds, contact Leeds roofers – DPR.